Day 8 got off to another late start, as we had an email from our magazine app developer with a new build that we needed to check out. Took a while to futz around with that, and it was 10:30AM by the time we hit the road. 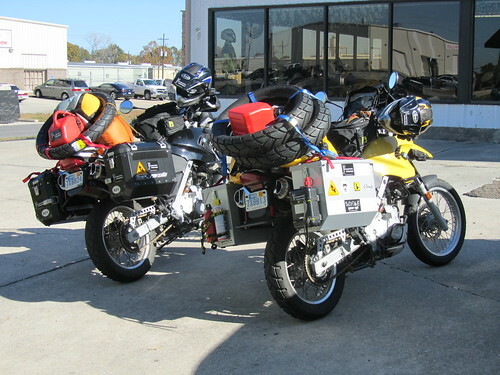 Arrived in Baton Rouge just after noon, where we picked up my new Anakee 2 tires at Hebert Cycles. The shop offered to mount them for us, but they were going to charge me an hour of shop service to mount them and we didn’t feel like spending $88 to do something we could do ourselves. So we threw the tires on the back of the bikes and headed toward our destination – Sea Rim State Park in Texas. Along the way, we ran into an oil refinery. Literally rode through the middle of it. I’ve never seen anything like it. It’s a massive complex – miles and miles of strange looking towers and industrial things and tons of piping everywhere; crossing the street, running along side the street. It was insane. Amusingly, we also ran into houses on stilts. It’s the first time I’ve ever seen houses on stilts. It was just like something out of Dr. Seuss – I was waiting for the houses to get up and start walking around. Real life isn’t that entertaining, though. Alas, we were racing the sunset (it still gets dark so early!) and it was dark by the time we arrived. We’re literally camping on the beach, though – in the sand and everything. For Day 8, we went from Houma, LA to Sabine Pass, TX – 316 miles. Wait… there’s a sea-bird, squeaking on the beach while I type. My ears are filled with the sound of ocean. I’m about to sleep on the beach for the first time in my life, and some tiny squeaky sea bird is just outside our tent. We’ve been brought here by these incredible machines, and yet… there are literally miles of oil refinery maybe twenty miles down the road. It’s glow lights up the horizon behind us. I feel incredibly fortunate, and a little bit guilty. I want to do this ride while we still can, before we humans have fucked up every place out there with our litter and lack of concern, and before we run out of gas. I don’t know what comes next, but I feel there’s going to be a time where gas is outrageously expensive, and there will be a period of years where there simply won’t be an alternative that’ll allow us to take a journey like this. We have to take this chance at adventure while we can.